3D printing refers to the technology of fabricating objects through the deposition of a material using a print head, nozzle, or similar printer technology. It is a game-changing technology that enables manufacturing goes digital and promotes a third industrial revolution in the Twenty-First Century. In construction, 3D printing has recently got attention from Government agencies. For example, Building and Construction Authority of Singapore has identified construction 3D printing as Tier 2 technology in the Construction Productivity R&D Roadmap published in 2017. 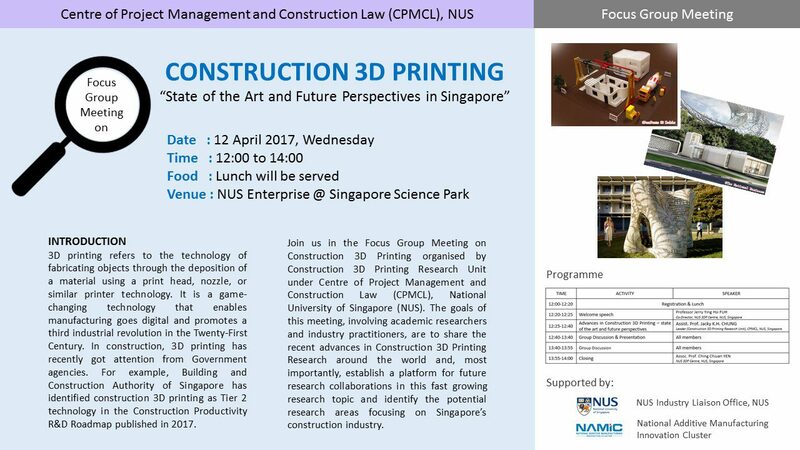 Join us in the Focus Group Meeting on Construction 3D Printing organised by Construction 3D Printing Research Unit under Centre of Project Management and Construction Law (CPMCL), National University of Singapore (NUS). The goals of this meeting, involving academic researchers and industry practitioners, are to share the recent advances in Construction 3D Printing Research around the world and, most importantly, establish a platform for future research collaborations in this fast growing research topic and identify the potential research areas focusing on Singapore’s construction industry.